Defense Minister says response to deadly stabbing attack should be more building in Jewish communities in Judea and Samaria. 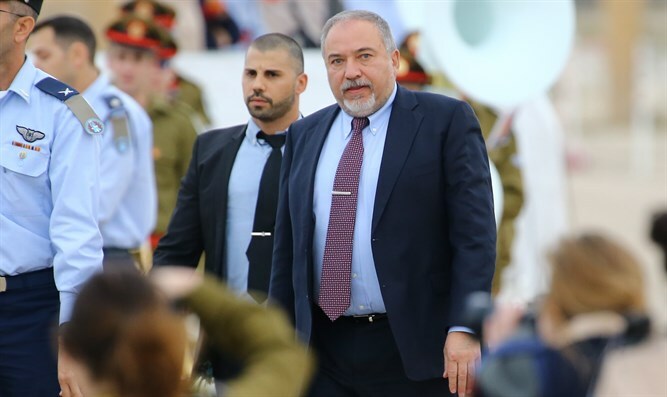 Defense Minister Avigdor Liberman announced that he intends to promote the construction of 400 housing units in the town of Adam in Binyamin in response to last night's deadly stabbing attack in the town. "The best answer to terror is the momentum of settlement in Judea and Samaria," Liberman wrote on his Twitter account Friday morning. "That's why I left this morning to promote a plan to build 400 housing units in Adam and approve it in planning institutions in the coming week." A 31-year-old Israeli Jew was murdered in the attack when a teenage terrorist infiltrated a private home in Adam and stabbed the occupants. Two other civilians were wounded. The terrorist came from the Palestinian Arab village of Kobar, the same village from which came the terrorist who carried out the massacre in Neve Tzuf and murdered three members of the Salomon family. Jerusalem Affairs Minister Ze'ev Elkin blamed incitement from the Palestinian Authority for the attack. "As in 2015, there are consequences for what happens [in the PA]. It is not an organized terrorist organization. We should be as interested in what is happening in the Palestinian education system and in sermons in the mosques as we are in any terrorist organization." Intelligence Minister Yissael Katz called on the government to begin expelling the families of terrorists. "I call on the prime minister, this is the time to allow the bill I initiated to expel the families of terrorists, as the most significant deterrent against individual terror." "The law must be implemented and the Palestinian Authority funds every shekel paid by Abu Mazen (Mahmoud Abbas) as an incentive to the families of the terrorists," said Minister Katz.